In 1876 Mr. Walters moved to Waterloo, Iowa, with his parents, where he engaged in the coal business about a year, then went on a farm until 1879, when he came to Boone county, Nebraska, and homesteaded one hundred and sixty acres of land in the southwest quarter of section twenty, township twenty-two, range seven, selling same about five years later. In July, 1885, Mr. Walters organized what was known as the Walters & Price General Merchandise Company at Garner Postoffice, fifteen miles northwest of Albion. In 1890 he moved with his family to Petersburg, Boone county, where he followed clerking, etc., and later engaged in the real estate business and edited a newspaper, remaining there thirteen years, during which time he also served as treasurer of the school board in 1902 and 1903, chairman of the town board in 1902, and justice of the peace for eight years. January 1, 1904, Mr. Walters was appointed deputy county clerk of Boone county, serving four years, and was then elected county clerk in the fall of 1907, taking charge of the office January 1, 1908, which office he is still filling to the satisfaction of his county. On November 26, 1885, Mr. Walters was married to Miss Cora E. Martin of Boone county, at Albion. Mr. and Mrs. Walters have had five children, three of whom are living: Oliver H., a printer in Columbus, Nebraska; Edna L., married to W. E. Baker, lives in Boone county, Nebraska; Louis E., deceased; Mabel E., deceased, and Clifford E., who resides at home. Mr. Walters' life history tells of the prosperity and success he has won, and besides the above chronicled facts, he has land interests in western Nebraska and local property in Albion, his present home. Mr. Walters has made his impress on the history of his county, and he and his family enjoy the respect and high esteem of all who know them, and their friends are legion. The prosperity enjoyed within the borders of Wayne county, Nebraska, is due in large measure to the enterprise and thrift of the farmers of that region. Their well-improved and well-tilled farms show good management and painstaking care, which has resulted in their present prosperity. Among the prominent farmers may. be mentioned the gentleman above named. He has been a resident of the county for a number of years, and is a substantial farmer, having acquired a good home by persistent industry and honest dealings, and is esteemed by all with whom he has come in contact. Mr. Splittgerber was born in Germany, near Berlin, in 1855, and is the son of Carl and Caroline Splittgerber. His early years were spent in his native land, where he obtained his education. In 1881 the Splittgerber family left their home to come to America, the land of liberty and opportunity. They came by way of Bremen to Baltimore, and started at once for the west, where land was cheap and there was an equal chance for all. They came to Wayne county, Nebraska, and Carl Splittgerber bought one-half section of land, upon which be lived for eight years. He then moved with his wife to Wisner, where lived until his death in 1904. After his death the farm was divided between his sons, William C. and Emil ; William C., now owning two hundred and forty acres of the old home place. He now has a well-equipped farm, with all necessary buildings, fences, stock and machinery. There is also now a fine orchard of two acres of fruit trees, all bearing well. Mrs. Carl Splittgerber has made her home with her son, William, since the death of her husband. In 1886 our subscriber was united in marriage Miss Caroline Ahlfers. They are the parents two children, Paul and Hulda. Mrs. Splittgerber, who was born in Hanover, Germany, came to America in 1883 alone, and joined an aunt in Saline county. In 1885 she came to Wisner, where she lived with another aunt until her marriage the following year. A history of Nebraska would not be complete without mentioning the name of Andrew P. Jensen, who for the past twenty-nine years has been a substantial and progressive citizen, always taking a keen interest in things pertaining to the welfare of his home state and county. Andrew P. Jensen was born in Denmark, December 11, 1854, a son of Jens Peterson, and by a peculiar Scandinavian custom takes his last name from his father's first. He was fourth in a family of six children, and has two sisters residing in Garfield county, Nebraska, the other children being deceased. The father, Jens Peterson, lives in Ord, Nebraska, at the advanced age of eighty-four years. He came to Nebraska in the fall of 1884. The mother died in 1904, in Valley county, Nebraska. Our subject received his education in the schools of his native country, and at the age of fifteen began to learn the carpenter trade, which he finished in due time, and later followed alternately with farming. On July 21, 1876, Mr. Jensen was united in marriage to Miss Johanna Peterson, also a native of Denmark. 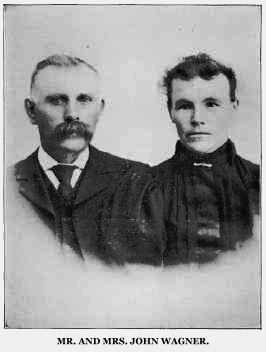 Mr. and Mrs. Jensen have had two children, namely: Marie, who is the wife of John Frandsen, has one child, and lives in the state of Montana, and Iner, deceased in 1887 in infancy. where he remained until the fall of 1885. Owing to cyclone and hailstorms, there was a total failure of crops, and Mr. Jensen felt the necessity of going back to Omaha, where he could work at his trade. In July of 1893 he again moved his family on his Valley county farm, where they remained until August 17, 1908, when Mr. Jensen retired from active farming and moved to Ord, where he has a bee-hive factory. Mr. Jensen is a successful man of affairs, and owns one hundred and sixty acres of good land, which is a fine stock and grain farm, well improved, and has also fourteen acres of timber land. He is a progressive man, interested in all pertaining to the welfare of his home county and state and enjoys the respect and esteem of all who know him. Mr. Jensen served as director of his school district, number twelve, for some years. A typical pioneer of eastern Nebraska is represented by the gentleman above named, G. Goble. He has lived many years in this section of the country, and has taken part in the growth and development of this region, building up for himself a substantial home and future by his perseverance and thrift, and has come to be one of the foremost citizens of Antelope county. Mr. Goble was born in 1862 in the state of Michigan, and is the son of Enos H. and C. (Venetta) Goble, the father being a native of Pennsylvania, and the mother a native of New Jersey. Our subject's father served his country in the civil war, enlisting in company F, Twenty-fifth Michigan infantry, remaining in the army from 1862 to 1865. Eight years later he went to Kansas, in 1873, taking up a homestead about thirty miles southwest of Topeka, and here the family experienced many discouragements, suffering from the hot winds and grasshopper raids, and the hard winter of 1873. Becoming dissatisfied in that locality, our subject's father and family returned to Michigan. In 1879 E. H. Goble and family came to Antelope county, Nebraska, taking up a tree claim on the northeast quarter of section thirty-one, township twenty-eight, range seven and here they built a small frame house and planted fifteen acres of timber. E. H. Goble died, February 23, 1887. G. Goble, our subject, in 1888, took up a homestead in the southwest quarter section thirty-one, township twenty-eight, range seven. On this homestead he built a sod house, in which he lived four years, and then built a frame house. In 1901 he bought out the heirs' interests in his father's tree claim, and moved onto that farm, where he now resides, and he has a well-improved and valuable property there. In 1906 Mr. Goble was united in holy matrimony to Miss Elizabeth Hobson, and Mr. and Mrs. Goble have had two children born to them, whose names are as follows: Harold and May. Mr. and Mrs. Goble and family are pleasantly situated in their fine home, and enjoy the respect and high regard of all who know them. Herman A. Kruetzfeldt, a well-to-do farmer, energetic and industrious, a typical representative of the sturdy German race, who came to this country to establish a home and accumulate a competence for his old age, resides on his farm, the northwest quarter of section thirty, township twenty-eight, range one. Although not one of the oldest settlers of Nebraska, Mr. Kruetzfeldt, since coming to this part of the country, has always done his share for the benefit of his community. Mr. Kruetzfeldt was born in the village of Stein, province of Holstein, Germany, August 9, 1863, the year before that region was ceded by Denmark to Germany. He is the son of Joachim and Anna (Klindt) Kruetzfeldt, also natives of Holstein. On coming to America in 1881, Mr. Kruetzfeldt sailed from Hamburg to New York in the "Cymbria," which some years later foundered at sea. He came directly to Davenport, Iowa, and for six years worked as a farm hand in Scott county. He then moved to Cass county, renting a farm from his father-in-law for fifteen years. In 1900 he came to Pierce county, Nebraska, where he has since made his home. His farm is a fertile tract of land, on which is a beautiful grove surrounding the substantial buildings, and an orchard of goodly size. Mr. Kruetzfeldt was married in Davenport, Iowa, February 18, 1885, to Miss Augusta Gottsch, a native of Scott county, and daughter of Joachim and Magarita (Lamp) Gottsch, natives of the village of Stein, Denmark, whence the father sailed the seas some eight or nine years. Mr. and Mrs. Kruetzfeldt have had four children: Harry, William, Arnold and Maud. Harry was educated at a business college in Davenport, Iowa, and is manager of the Edwards & Bradford Lumber Company at McLain; William received his education in Wayne, Nebraska, and is manager for the same company at Belden, and Arnold is being educated at the college at Wayne. In politics, Mr. Kruetzfeldt votes the democratic ticket. He belongs to the Sons of Herman lodge, and he and his family worship at the German Lutheran church. Mr. and Mrs. Kruetzfeldt and family are highly respected by all who know them. death was deeply felt by all who knew him, as he was looked upon as one of the leading public spirited men of the county, and held in the highest esteem and respect by his fellow men. Peter D. Vorhes was born in New York state, February 15, 1830. He moved to Michigan with his parents when a small boy, and when a young man, in company with his brother Fred, went to California, remaining in that country for about fifteen years. There they were engaged in blacksmithing, prospecting, mining, etc., saw a great deal of the western life, and succeeded in getting together some property. Peter returned to Michigan, and was married there to Miss Emil J. Goodman of Oakland county, and they made that locality their home up to the spring of 1877, when the family, consisting of himself, wife and daughter, Ada Jane, now the wife of W. E. Baliman, came to Howard county, and settled on a homestead, which our subject purchased, on section thirty-two, township thirteen, range nine. They worked hard, and passed through all the early Nebraska times, meeting many discouragements in the early days, but gradually succeeded in improving their homestead. At one time a prairie fire swept the country, and burned a barn and granary containing his season's seed and grain supply. The house which he built was the first frame built in his section of the country, some of the lumber being brought by team from Omaha. In 1890 Mr. Vorhes built a home in Grand Island, and moved to that city, where he engaged in the wagon-making business. In 1891 he returned to the farm and remained two years, and then went back to Grand Island, which remained his home until his death. He was known as a prosperous and progressive farmer, his success due entirely to his thrift and industry. Among the worthy citizens given to America by the fatherland, none stand higher in his own community than the Wagner brothers, John and Matthew. John Wagner was born near the town of Bittburg, in the village of Meserich, Rhine Province, Prussia, September 2, 1842. He was employed at farm labor the years he lived in the fatherland, and naturally found farming a congenial occupation on reaching the new world. According to the custom of the old country, he served something over three years in the Prussian army, from 1863 to 1866, during which time he participated in the wars with Schleswig, Holsteine and Austria, in 1864 and 1866, respectively, in the artillery service. He began his military career in Berlin, and was honorably discharged there at the end of his enlistment. In 1868 the brothers emigrated to America, sailing from Antwerp to Liverpool, and on April 15, thence on the "Erin," landing in New York the 9th of May. Proceding direct to Chicago, John Wagner worked there ten days to secure funds for transportation to Monmouth, Illinois. In July he went to Milwaukee, and soon after to a farm three miles from Waukegan, Illinois. About the first of September he found employment on a railroad, then being constructed through Iowa, and first set foot on Nebraska soil at Omaha some time in November. Omaha was then a comparatively small town and the gateway to the west. In the spring Mr. Wagner secured employment as driver in the government service, and was stationed at Cottonwood Springs, near the junction of the North and South Plattes. During the six months he worked here, he had many hard experiences. One day while working on the bridge across the North Platte river his revolver fell into the river; in grabbing for it, he jerked his watch from his pocket, and so far as known both are there in the river to this day. Lice, ''chinces' and sand fleas were numerous in every camp. For safety from the Indians, men dug short tunnels into the hills for sleeping quarters. In these they spread grass, and rolled up in their blankets with their rifles and revolvers at their sides. One time, in swimming the Platte, the current carried him a mile and a half down the stream before he could make a landing on the other side. While at Cottonwood Springs, Mr. Wagner became acquainted with Mr. Zeph and Mr. Hengstler, now for years neighbors in Knox county. Returning to Omaha, Mr. Wagner secured work with Louis Crow, who established the first packing house in the city, it being located at Fifteenth and Douglas streets, and remained in his employ three years. For a short time the brothers worked in Plattsmouth, and then returned in the spring of 1871, to Omaha, to purchase oxen, a wagon and supplies for their trip to Knox county, which was recommended to them as being a desirable place to locate. Travel was slow as they had no feed, and were compelled to stop after a few hours' travel to allow the oxen to graze. In coming, they followed up the Little Elkhorn to near where Osmond now stands, and then turned to the northwest, over the watershed, into the valley of Bazile creek. At that time in Creighton there was but one sod shanty on the east side of the creek. George Quimby had laid out a townsite called Mansfield, about a mile south of the present site of Bazile Mills. Here Mr. Wagner, with his brother, arrived on Good Friday, which fell in April that year, a few hours before the ''Bruce Colony," which had wandered out on the Elkhorn, crossed back to Niobrara, and finally reached their destination from the north, instead of from the south, as they had at first intended. Henry Mecke and Sebastian Zeph had preceded them a short time, and secured claims in the neighborhood. Mr. Wagner located a homestead claim a mile north and west from Creighton, and in the fall returned to Omaha, where he worked until spring. While here, he married, and in the spring started for his new home with his young wife. The railroad extended to West Point or Wisner, and here Mr. Wagner engaged a settler, living eight miles from West Point, to bring him to Creighton. Here he purchased a cow, some chickens, and secured some wheat. There being no way to take the cow with him at the time, Mr. Wagner returned some months later, walking nearly all the way to West Point - a little less than sixty miles - and on foot led the cow back to his Knox county home, purchasing a milk bucket at Norfolk on the way. How many young men these days would walk a hundred miles to supply the source of milk and butter for their family? There was a log house on Mr. Wagner's homestead, built by an early pioneer who had become discouraged and abandoned his claim. Here the family lived some years, until a more commodious frame house could he erected. Here Mr. Wagner lived until October, 1903, when he came to town, that his children might attend parochial school. Mr. Wagner was first married October 25, 1872, to Miss Lydia Horst, a native of the province of Hanover, Germany, who came to America in 1867. Her people died in Germany, and she came to the United States when twelve years old, with neighbors and lived first in Illinois, later in Iowa, and finally moved to Omaha. Nine children were born to Mr. and Mrs. Wagner. The eldest, Helen is the wife of A. R. Johnson of Plattsmouth; Margaret is married to Frank Abbenhaus, a farmer living near Bloomfield; Katie with her husband, John H. Abbenhans, is now living on a claim in Tripp county, South Dakota; Mary Theresa died at the age of eight years; Matthew J., is part owner of an elevator in Creighton: Ann, the wife of Wm. Young, lives in Antelope county Frank H., is in business with Mathew ; Leonard J., cultivates the home farm; and Mary the youngest is housekeeper for her brother, Leonard J. The wife and mother died August 19, 1890. On January 22, 1894, Mr. Wagner was married to Mrs. Franceska M. Haak, a native of Washington county Wisconsin, born March 19, 1854. Her parents, Franz and Catherine (Gersing) Schneider were natives of Germany, and came to America in 1847. They moved to Nebraska in 1873, settling in Knox county. Here they enduring many hardships, the girls having to work in the fields with the men in order to make a living for the family. At times their only food was corn bread and water for breakfast and supper, and the same with a small piece of bacon for the noon meal - not a very nutritious ration for young women pitching wheat in the fields all day. Franceska Schneider was married to Peter Haak, September 12, 1878. He was a German, but born in Poland, June 22, 1848, and died on his farm in north Creighton, March 21, 1893. During the early years of his residence in Knox county, he freighted across the country to Yankton for the merchants at Bazile Mills. He worked for a time in the reconstruction of a railroad through the country, and at times during his absence, Indians came to the house to ask for food. Mrs. Haak always gave them what she had, having no fear of them, and never had any of their stock molested. Their children are: Leo, who farms on the homestead claim near Winnetoon; Luke Z., residing on the timber claim secured by his father; and Mary C., who keeps house for her younger brother. Of their second marriage, Mr. and Mrs. Wagner are the parents of one daughter, Adelia C., a student in the parochial school in Creighton. During the first years of the settlement of northern Nebraska, great herds of Texas cattle were driven across the country to the Niobrara to issue as beef to the Indians. They were allowed to cross the farms of the settlers, trampling the crops and where they had passed, the ground was pressed so hard it required a re-plowing. No satisfaction was given the settlers for this destruction of their crops, and little complaint was made; the cattlemen carried arms, and were too ready to use them. Blizzards caused great suffering. Mr. Wagner had his face, nose and cheeks frozen in such a storm. He allowed the oxen to flounder their own way through the open prairies, he not daring to lose his hold on the wagon, as he might never have found it again, nor his home. Crossing the Little Elkhorn at through, Mr. Wagner had to walk several miles in his wet clothes before he found a cabin in which to spend the night, and did not get his clothing dried until along in the next day. In the blizzard of 1888 he lost thirteen cattle, a good share of all he had. After "the winter of the deep snow," 1880 and 1881, snow lasted until into the summer. Enough was found in the canyons near Bazile Mills to freeze ice cream at the Fourth of July picnic. Money and work were so scarce that Mr. Wagner walked to West Point - sixty miles - several seasons to labor in the harvest fields, and then walked home with the proceeds and a few provisions. To save matches, they were carefully split into four pieces, and each piece being made to do the service of a whole match. Groceries for a year or two were hauled from Yankton fifty miles away. And for coffee, queer substitutes were found. They used parched corn at Dry Creek, dried peas at West Point, wheat at Pierce and burnt bread at Bazile Mills. Mr. Wagner leans toward the populist principals in political matters. The family all worship at the altar of the Catholic church, and the three youngest children have been educated in parochial schools, which were establish at Creighton in 1903.
ing his ease in his comfortable village home. On another page will be found portraits of Mr. and Mrs. Wagner. Mr. and Mrs. John Wagner. Neils Jorgensen, one of the best known and most highly respected citizens of Valley county, Nebraska, has been a resident of central Nebraska for the past twenty-six years. He has acquired a valuable property through his industry and thrift, supplemented by good management and honest dealings, and well merits the success he has attained. Mr. Jorgensen was born in the village of Horseus, Linerip district, province of Jutland, Denmark, February 4, 1847, a son of Jurgen and Mina (Janssen) Neilson. He received his education in the schools of his home country, and later engaged in farming. In the summer of 1884 he came to America, sailing from Hamburg to New York, the voyage lasting two weeks. Locating in Cedar county, Nebraska, he engaged in farm labor for nearly two years, and in 1885 moved to Holt county, where he homesteaded one hundred and sixty acres of land, six miles north of Amelia, and this remained the home place until 1893, when he came to Valley county, and purchased four hundred and eighty acres in section ten, township twenty, range fourteen, which is now the home place. He owns one hundred and sixty acres in Elyria township, and a quarter section in Garfield county. The family lived in a sod house for a time, and in 1901 built a substantial frame dwelling, and good barns and other farm buildings from time to time. He also lived in a sod house for seven years in Holt county. On August 11, 1884, Mr. Jorgensen was married to Miss Hannah Worm, who also was born in Denmark, and came to America in 1884. She is a daughter of Wilhelm and Carin (Jensen) Worm. Mr. and Mrs. Jorgensen have had five children, namely: William, who resides at home; Henry, married, and residing on the Garfield county farm; and Walter, Mena and Nora, who are residing under the parental roof. Mr. Jorgensen is a prosperous and successful man of affairs, owning eight hundred acres of good land, all in Nebraska. He is a man interested in all pertaining to the welfare of his home state and county, and is widely and favorably known. Mr. Jorgensen has served twelve years as moderator of his school districts, numbers forty-five and fifty-four, which record demonstrates his interest along educational lines. John E. Blomquast, son of Ole and Margaret Blomquast, was born in Sweden, April 21, 1843, second in a family of three children, and is now the only survivor of the family, a brother and sister being deceased, and his father died in February, 1871, and the mother in August, 1868. On July 25, 1869, Mr. Blomquast was joined in wedlock to Miss Augusta Eklund, also a native of Sweden, who came to America in 1869; a daughter of Alex and Breta Eklund. Her father died in 1887 and the mother in 1900, both in Platte county, Nebraska. She has a brother residing in New Zealand, Australia. In 1877 Mr. Blomquast located in Platte county, homesteading one hundred and sixty acres, which remained the home place about twenty-two years, during which time he purchased eight hundred acres more. In 1900 Mr. Blomquast retired from farm life, and moved to Newman Grove, Madison county, where he built a fine home, which is his present residence, and in 1905 sold his Platte county interests. In 1894 Mr. Blomquast became interested in banking, and was vice president of Newman Grove State Bank until 1905, and has also been vice president of the Citizen's Bank in Newman Grove for several years. He served Platte county as supervisor for one year, and was on the school board about twenty years. Mr. and Mrs. Blomquast have had three children: John A., who is married, lives in Boise City, Idaho; Albertina E., died March 21, 1908, she had been married to Eric Hollgrin, and lived in Newman Grove, two children being born to them; and Alfred E., who resides in Walla Walla, Washington. Mr. Blomquast is well known, having been prominent in business circles, and is a progressive man, alive to all the interests of his state and country. The Hancocks were the fourteenth family to locate in Sherman county, and have always stood for the best interests and welfare of their community. William Hancock, who has spent most of his life in the county, well remembers pioneer conditions and experiences. He was born August 14, 1861, in Sullivan county, Indiana, and is a son of Samuel and Rachel (Davis) Hancock, the father a native of Georgia and of Irish extraction, and the mother a native of Ohio, of German descent. Samuel Hancock, who was an orderly sergeant in the union army during the civil war, brought his family to Sherman county in 1873, and secured a homestead, where he spent his remaining days. His wife died in 1887 and he in 1900. William is the fifth of eight children, and he has one brother in Colorado, a brother and two sisters in Nebraska, two sisters in California, and a sister in Oregon. tion work for the B. & M. and the Union Pacific railroads, and later engaged in farming on his own account. His first purchase of land was one hundred and sixty acres, which he secured in 1895, later owning and operating various farms, and in 1905 he bought his present estate of one hundred and sixty acres of land in section twenty-nine, township fourteen, range fifteen, where he has erected a very comfortable residence and other buildings, and made many needed improvements. His land is now in a high state of cultivation, and he is accounted one of the most successful farmers of the vicinity, being widely and favorably known, ask he is one of the oldest settlers in the county. He has always been much interested in the cause of education and other movements for the public welfare, and for the past ten years has served school district number thirteen as school treasurer. Mr. Hancock was married at Loup City, May 11, 1892, to Miss Cora Castner, who was born in Ohio, a daughter of Elijah and Eliza (Kitchen) Castner, both of German descent, the former a native of New Jersey and the latter of Ohio. Her father died in Pennsylvania in 1899, and her mother in Ohio in 1877. She has two brothers in Pennsylvania, a brother in Ohio, and a sister in Sherman county, Nebraska. Nine children have blessed the union of Mr. Hancock and wife, all at home, namely: Harold L ., Earl S., Arthur L., Cecil J., Sadie G., Hemple M., Fern H., Ernest W. and Russell. For two years after their marriage, Mr. and Mrs. Hancock lived in a sod house before building a frame dwelling. In politics Mr. Hancock is a democrat. He is a member of the A. 0. U. W. and the Degree of Honor. In selecting land on which to build a permanent home, much is to be considered. The task is less difficult in a country where civilization has marked the causes and effects of the elements on human work, but in a pioneer country, where little except the boundless prairie is in evidence, the task becomes one of more difficulty. To decide unwisely means many years of futile toil before one is convinced of the waste of time and endeavors, while a wise judgment brings reward beyond the expectations of all. Among the early settlers of Cedar county, who have been intimately identified with its growth and development, may be mentioned Mr. Hirschman, who is a native of the state of Wisconsin, having been born there in 1855, the son of Fredland and Anna Myra Hirschman. As may be supposed, both parents were foreign born, the father being an Austrian and the mother a Prussian. The father came to this country on a sailing vessel, and was forty-two days on the sea. He took a lively interest in the affairs of his adopted country, and when the civil war broke out, he enlisted, and served for some time under Sherman. Mr. Hirschman lived with his parents in Wisconsin until 1871, when the whole family decided to join the westward migration. They took the overland route, and drove from Wisconsin to Cedar county, Nebraska, where they purchased what was known as the "Joseph Knox homestead." There was nothing but a small "shanty" on the place at that time, which has long since been replaced by a comfortable and commodious home. The farm itself has been improved in many ways, and is now very valuable. Following the usual experience of the early settlers, Mr. Hirschman and his people suffered many hardships. For the first four years they were unlucky enough to have the grasshoppers take all the crops. Then during the second winter after their arrival in Nebraska, they suffered much by reason of an unusually heavy snowstorm. They also lost all of the crops in 1894 by the hot, dry winds prevalent during the greater part of that summer. However, Mr. Hirschman persevered in his efforts, and by the exercise of unending thrift and economy, was able to add, little by little, adjoining lands, until he is now the possessor of about seven hundred acres of highly-improved land, an estate quite as valuable as any to be found in that section of the state. In 1879, just eight years after coming to Cedar county, Mr. Hirschman married Miss Bertha Dreason. They are the parents of four children. Mr. and Mrs. Hirschman have always been thoroughly interested in the growth and development of the state, and they enjoy a more than local prominence. Robert G. Baird, retired farmer, son of Hugh and Martha (Brown) Baird, was born in Randolph county, Illinois, October 31, 1839. He was the fifth of ten children, of which only three are living, Mr. Baird and a brother and sister who reside in Illinois. His parents were natives of South Carolina, but died in Randolph county, Illinois, his mother in November, 1880, and his father in 1856. Robert G. Baird was educated in his home schools, and later engaged in farming in Randolph county. On May 11, 1861, Mr. Baird enlisted in the service of his country from the state of Illinois for state service, subject to call of the United States, and on June 11, one month later, was assigned to company H, Twenty-second Illinois infantry, serving something over three years, receiving his discharge July 8, 1864, in Springfield, Illinois. He enlisted in the first company organized in Randolph county. While in the service, he participated in the battle at Belmont, serving mostly on detached duty. After he returned to Illinois, Mr. Baird engaged in farming. On January 18, 1866, he married Mary J. McDonald, who was born in Randolph county, Illinois. Her parents were William and Jane (McClelland) McDonald, both of Scotch-Irish descent, who came from South Carolina to Randolph county, Illinois, at an early date. Mrs. Baird was the eighth in a family of twelve children, five of whom are now living. In the fall of 1871, our subject came with his family, in company with his brother, James Baird, and family, to Merrick county, Nebraska, where he homesteaded one hundred and sixty acres in section twelve, township fourteen, range six, which has since that time remained the home place, with the exception of eight years spent in Illinois, between 1877 and 1884. Mr. Baird was instrumental in organizing his school district, number twenty-one, and served in the various offices of its boards for many years. Mr. and Mrs. Baird are charter members of the First Presbyterian church in Merrick county, which was organized at Central City in 1872. They have had ten children: Wm. H, deceased in infancy; Prudence A., deceased in 1902; Hugh A., who is married, and has three children, and lives in Central City; Lucinda E., married to W. S. Desh, who have four children, and reside in Central City; Mary J., married to M. G. Scudder, who have four children, and reside in Central City; Martha A., who was married to C. H. Crites, has four children, and lives in Central City (Mr. Crites, a Union Pacific brakeman, was killed while on duty, in 1906); Elizabeth, who resides at home; Robert B., who is married, and resides in Merrick county; Cora A., married to George E. Bockes, Central City; and David M., married, who lives on the original homestead, and has one child. In the spring of 1910, Mr. Baird retired from the farm, and moved to Central City where he purchased a good home, their present residence. He is an active man of affairs, interested in all pertaining to the welfare of his home state and county, and is widely and favorably known. Few men in the priesthood have won higher favor in their community than John G. McNamara, pastor of St. Andrews Catholic church of Bloomfield. ''Father Mack,'' as he is familiarly called, is a favorite with both Protestants and Catholics, and has been a power for good in his parish. John G. McNamara was born in Wisner, Nebraska, March 1, 1872, a son of James and Margaret (Carpenter) McNamara, both natives of old Ireland, the father from County Mayo, the mother from Queen's county. James McNamara came to America in 1863, sailing from Queenstown in a full-rigged ship, and landed in New York, whence he came west to Kankakee county, Illinois. Here he farmed for eight years, and after his marriage, March 7, 1871, came west with his bride and settled in Cuming county. The mother emigrated to the States in 1868, the voyage lasting six weeks. After living for a time in Cincinnati, she came to Kankakee, where her marriage took place. Mr. McNamara bought a farm, six miles from Wisner, Nebraska, and resided here until 1903, when he retired from active life, and moved to Wisner to make his home. "Father Mack" was reared on his father's farm near Wisner, attending the country schools for five years, and for three years the Guardian Angels' parochial school at West Point. For five years he was a student of St. Francis' College at Quincy, Illinois, graduating in the classical course, and finished in theology and philosophy in Mt. St. Mary's Seminary at Cincinnati, graduating March 4, 1897, the day of McKinley's inauguration. His first appointment was as assistant to the priest in Norfolk, Nebraska, where he officiated about eighteen mouths, and was next sent to the Church of the Sacred Heart at Omaha for one year. Jackson, Nebraska, was his next field of labor, and after a year of services there, he was assigned to the Bloomfield church, November 4, 1900. When "Father Mack" came to the parish here, the church, a small one, was in the low ground near the creek. He soon formed plans for something better. He purchased several acres of land on the high ground in the southeast part of town, and built a substantial rectory in 1901. In 1903 a commodious church building was erected on the lot adjoining. This was entirely paid for within four years, though the effort necessary to accomplish this was great, especially when it is considered that the parish is small and many of the parishioners poor. When this was all accomplished, "Father Mack'' thought to let building enterprises rest the remainder of his pastorate here, but the needs of a school, where the young of his parish might receive better education under the supervision of teachers of their faith, began to stir himself again, with the result that in the summer of 1910 a three story modern school building was erected opposite the pastoral residence - a building modern in all its details, which, with all equipments, will cost in the neighborhood of twelve thousand dollar's. To all of these enterprises "Father Mack'' has given freely of his time his thought, his energy and his money. his heart and soul have been in this work, and it is little wonder he stands high in the affection of his flock, and in that of his neighbors and fellow townsmen. A man who can in ten short years come into a small and impoverished parish and add so many sightly edifices to the public buildings of a town, is truly a public benefactor.